This article appeared as an introduction to a Comparison Chart on Flat Panel Displays in the July/August 2015 issue. State-of-the-art imaging displays are a must for the healthcare arena, and today have an increasing capacity to offer large, high-resolution displays, color accuracy, calibrated brightness, advanced connectivity, optimized workflow and high contrast, just to name a few. A variety of vendors continue to improve the technology to better display imaging modalities, including computed tomography (CT), magnetic resonance imaging (MRI), X-ray, positron emission tomography (PET), mammography and ultrasound, and to ensure screens remain DICOM (digital imaging and communications in medicine) compliant. Several flat panel displays recently received U.S. Food and Drug Administration (FDA) 510(K) market clearance, including NEC Display Solutions of America's MultiSync MD322C8 LCD, a high-resolution display for radiology review applications in healthcare organizations. It features a 32-inch display and is an 8 megapixel (MP), ultra high-definition review monitor boasting four times the resolution of full HD. The monitor is calibrated at the factory to the DICOM grayscale function for luminance. Designed for calibrated, stable brightness, color accuracy and high pixel density, the MD322C8 display creates opportunities for radiology review and surgical suite applications. NEC also received FDA approval on its MultiSync MD210C3 LCD. It is a cost-effective display with LED backlighting for diagnostic applications in healthcare organizations. The 3 MP, 21.3-inch MD210C3 is a diagnostic monitor designed to meet the needs of healthcare facilities using picture archiving and communication systems (PACS) in diagnostic imaging. Calibrated at the factory to the DICOM grayscale function for luminance, the MD210C3 includes a front sensor to maintain calibrated brightness. A human sensor reduces LCD brightness when the user leaves the monitor, saving power and extending the life of the display. In addition, all-digital connectors, including DisplayPort and a two-port USB hub, enable advanced connectivity for any type of workstation. Last year, Eizo expanded its FDA-cleared large monitor system with the addition of the RadiForce LS580W monitor and LMM0802 large monitor manager for interventional radiology and surgical suites. These larger monitor systems offer additional options to medical professionals while continuing to provide a high level of customer assurance. In the operating room (OR) and interventional suite, essential information such as X-ray, endoscopy and electrophysiology (EP) images are typically displayed using multiple monitors. The RadiForce LS580W is a large 58-inch widescreen monitor with 4K ultra HD display for viewing a variety of essential medical information on a single screen. This allows users to view important information consistently and conveniently in one location. With the LMM0802 large monitor manager, users can scale and position several source video windows to suit their preferences and working conditions. This flexibility allows surgeons and interventionalists to easily optimize their workflow. The Barco Coronis Fusion 6 MP LED has a wide viewing angle for a screen area that is 100 percent compliant to the American College of Radiology (ACR) guideline for luminance ratio. Radiologists can see subtle details more quickly, with less zooming and panning due to its bright calibrated luminance (500 cd/m²) and large screen size (30.4-inch). It offers color uniformity correction at the pixel level to eliminate screen noise, and its enhanced anti-reflective protective front glass helps reduce eyestrain. The display comes with a proprietary display controller, validated with the latest workstations and with all major PACS applications. Barco offers a 5 MP diagnostic display system, the Nio 5 MP LED. Cleared by the FDA for radiology and mammography and featuring a number of image-enhancing technologies, its 5 MP display provides excellent image quality that helps clinicians provide confident diagnoses. Bright LED backlights help radiologists see numerous shades of gray, and its Uniform Luminance Technology makes subtle details more noticeable more quickly, resulting in reduced windowing and leveling time, and comes with a front-of-screen sensor that works seamlessly with Barco's online MediCal QAWeb solution for automated quality assurance and on-demand calibration. The system offers a high-bright LCD panel with a display resolution of 2,560 x 2,048 pixels, and a DICOM-calibrated luminance of 500 cd/m² throughout its entire lifetime. It offers accurate grayscales and a high contrast ratio (1,200:1) to ensure confident image reading. Double Black Imaging also offers a 5 MP color LED display for multimodality imaging, the DBICX50-LED. The X-Series LED backlit LCD line consists of a 2 MP monochrome and high-bright color, a 3 MP monochrome and high-bright color, 6 MP high-bright color, a 5 MP monochrome and color LCD, and 10 MP display for mammography. This line features higher brightness levels on each LCD, digital uniformity control, 14-bit processing, a retractable front sensor for true DICOM calibration, and a backlight sensor for luminance control and display port connectivity. NDS Surgical Imaging's (NDSsi) 27-inch Radiance Ultra is a next-generation surgical visualization platform that offers an ultra-high level of brightness from the LED backlight that overcomes reflections and glare that occur in high ambient light environments and increases the usable contrast ratio, allowing surgeons to more easily visualize recessed anatomy. Medi-Match color calibration technology ensures that the color of tissue and other anatomy is always rendered accurately and consistently over time from display to display. Each system is precisely calibrated, enabling zero-latency, pixel-by-pixel color response correction in real time. The sealed edge-to-edge front panel incorporates for a seamless design, enabling faster operating room turnaround and enhanced clinical efficiency through quicker and more convenient cleaning and disinfection. At RSNA 2014, Canon U.S.A. Inc. showcased a work-in-progress color display for mammography images. The display is being developed by Canon U.S.A.'s parent, Canon Inc., who intends to file a 510(k) application with the FDA with regard to the display. It is currently contemplated that the display will be a 30-inch, 10 MP (4,096 x 2,560 pixel) color display for mammography. The display is subject to change, but is something to keep your eye on in the future. 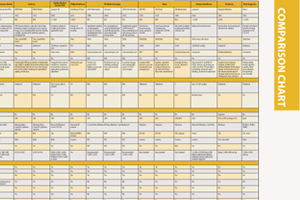 ITN has created a comparison chart of flat panel display specification from the vendors at www.itnonline.com/content/flat-panel-display. Access will require a login, but it is free an only takes a moment.